The rarely produced opera of Agostino Steffani. The opera is being presented at the Mahaiwe on June 24 and 25. A group of opera fans. The Boston Early Music Festival North American premiere piece de resistance is the long-forgotten 17th century opera “Niobe, Regina de Tebe”. 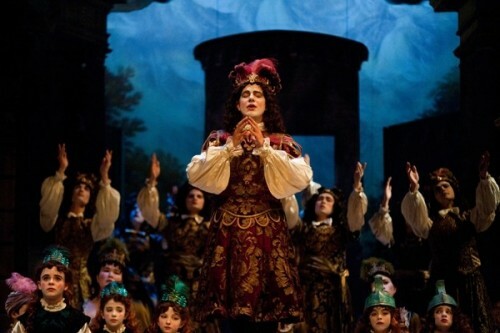 Originally written for the Munich Carnival of Elector Maximilian II Emmanuel court by the Italian composer Agostino Steffani in 1688, the opera was resurrected in 2008 by the Schwetzingen Festival in Germany toured Europe, then in 2010 was restaged by the Royal Opera at Covent Garden. Performed to great acclaim at the Boston Cutler Majestic Theatre, the opera will move to Great Barrington in the Berkshires. This is a rare and thrilling chance to experience a work of a forgotten master. Musicologists place the polymath Steffani (1654-1728) somewhere between Cavalli and Handel opera seria, the latter admired him for his musicality and originality. While lacking the complete da capo form, nevertheless, Steffani’s instrumental music is historically important as a factor in the artistic development of Handel. The opera’s overture shows a remarkable combination of Italian suavity with a logical conciseness of construction due to French penchant. 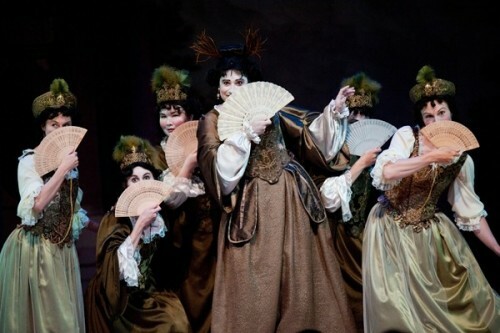 The Luigi Orlandi Italian libretto captures a fascinating moment in operatic history, it is intricate and multifarious. The opera recounts the events that lead to the destruction of Niobe Queen of Thebes as narrated by Ovid. Niobe is one of the most tragic figures of Greek mythology. Through hubris and amorous intrigues, she so angers the gods that they take the life of her children and turn her into stone. This is an unfortunate tale where desire and pride transcend constancy, love and honor, reminding mortals that, if defied, the Gods will seek swift and enduring revenge. The festival presents some fine singers with the exceptional presence of three countertenors: Phillippe Jarrousky, Jose Lemos, and Matthew White. 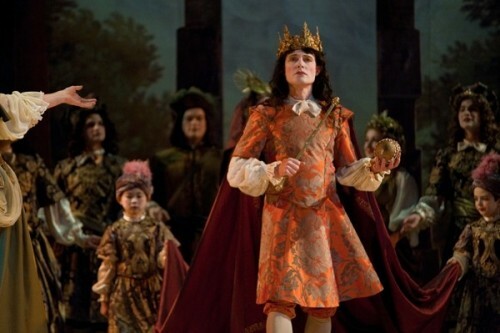 The lead role of Anfione features historically a castrato that is revived in this production by a male soprano, the French born Philippe Jarrousky whose countertenor voice has audacious, powerful nuances and an extraordinary clarity and vocal range to brilliantly portray his character transformation from abdicating dilettante to betrayed, bitter monarch. It is interesting to note that, traditionally; a castrato would play this part. Castrati were men who had either an endocrinology condition or were castrated before puberty to preserve their hi-pitched voices. José Lemos is the amusing, humorous assertive Nerea and Matthew White, is the Thessalian prince and Niobe’s lover, Creonte. They both provided exceptional performances. and naïve Manto. The tenors, Colin Balzer is Tiberino Manto’s charming suitor and Kevin D. Skelton is the languid, romantic Clearte. Charles Robert Stephens as Tiresia and Jesse Blumberg as Poliferno, both baritones judiciously and astutely portray their characters’ opposing and contrasting roles. Niobe, sung by Amanda Forsythe with her pretty soprano voice lacks the coloratura range – from the flirtatious lover to the tragic agonizing and sorrowful figure – that the role commends. Gilbert Blin tastefully and elegantly stages the opera. Mastering the architectural space and gracing it with imaginative, splendid and sequentially opulent Baroque sets, he brings to mind the paintings of Claude Gelée – Le Lorrain in the second act and Fragonard in the third. The trompe l’oeil paintings are technological giclée transfers to canvas mounted onto foldable, easy to reassemble sets. The visceral and sensual appeal of the staging draws on iconography and imaginative coup de théâtre that are direct and dramatic. The richness of the score and the libretto's mythological elements are enhanced with such visual moments as the cascading clouds to Deus ex Machina interventions when the Gods descend from Heaven to seduce or condemn Niobe. Mr. Blin’s extensive personal etchings collection of Maximilian II of Bavaria, the Goddess Latona and others subjects related to the opera enhance the historical documentation. The festival is also indebted to Professor Colin Timms of the University of Birmingham and Steffani operas’ ubiquitous expert for archival research, precision and accurateness. 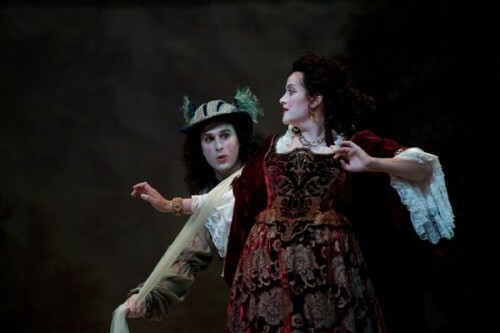 Interspersed with numerous dances (French in rhythm), Caroline Copeland and Carlos Fittante's choreography imbues the opera in the baroque style. The dance poses depend on contrapposto ("counterpoise"), where the tension within the figures that moves the planes of shoulders and hips is in counterdirections. These contrapposti transmutes with great fluidity the dancers’ bodies into sculptural forms. They are also accompanied by a talented children’s troupe. Anna Walkins's costumes richly hued, velvet golden patterns of Cintamani and Kashmir inspiration and the Heliopolis-shape headsets contrast with the dramatic staging. Both Paul O'Dette and Stephen Stubbs Emmy award winners and the festival directors (playing respectively – theorbo and Baroque guitar – share equally in conducting the Boston Early Music Orchestra, to the delight of early music lovers. Their music expands the size, range, and complexity of instrumental performance particularly where each of the opera character is often assigned his or her own instrument – Anfione accompanied with the virtuosity of a small strings and viola de Gamba, and the nurse Nerea singing her earthbound arias with the artistry of recorders. The recitatives are expressive and poetic blending with the da capo very short arias. The music is full of ornamentation while surprising with strong orchestral color. It is a feat of unity of mood, rhythm, melody, terraced dynamics, and texture and basso continuo and figure bass. “Niobe, Regina di Tebe” opera selection could not have been more appropriate for the festival’s theme of Ovid Metamorphoses; a transformation set of tales with themes that continue to exert the most profound influence on Western Culture. An enthusiastic and fervent audience applauded warmly all the singers especially Mr. Jarrousky to a triumphant achievement. A must see. “Niobe, Regina di Tebe,” ran through June 19, 2011 at the Cutler Majestic Theater of Emerson College and comes to the Mahaiwe Performing Arts Center, 14 Castle Street, Great Barrington, MA, on June 24 and 25, 2011; (413) 528-0100. bemf.org.